1-pound skirt steak trimmed of excess fat. If not steak you can use the grilled vegetables mentioned above. We use corn tortillas, but can use flour, also fresh lime and your favorite tomatillo salsa. Combine jalapeno, garlic, cilantro, lime juice, oil, brown sugar, salt, pepper and cumin in a large bowl or resalable bag. Add steak into mix and coat thoroughly. Let marinate for 30 minutes at room temperature or can be placed in refrigerator overnight tossing occasionally. Important to have steak at room temperature prior to grilling, at least 30 minutes. Bring grill to medium-high heat, Grill steak 2-3 minutes pers side for medium rare, 5-6 minutes for medium to well done. Remove from gill and let rest 10 minutes before thinly slicing against the grain. 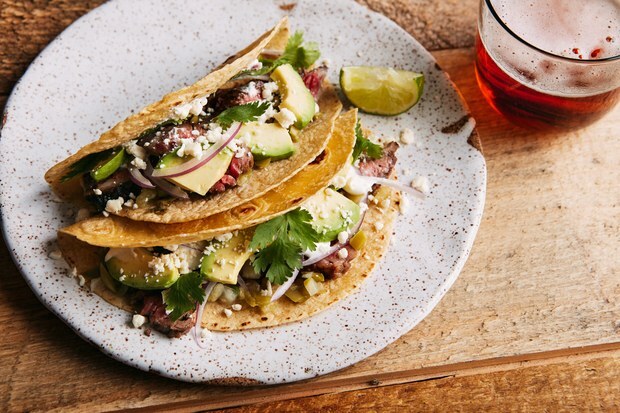 Warm tortillas on the grill over low heat, can divide steak among tortillas, top with salsa, cilantro, and any other toppings you might like, avocado, queso fresco. Serve with lime wedge and enjoy.